← Tweets This is what I woke up to. When it rains it pours…. 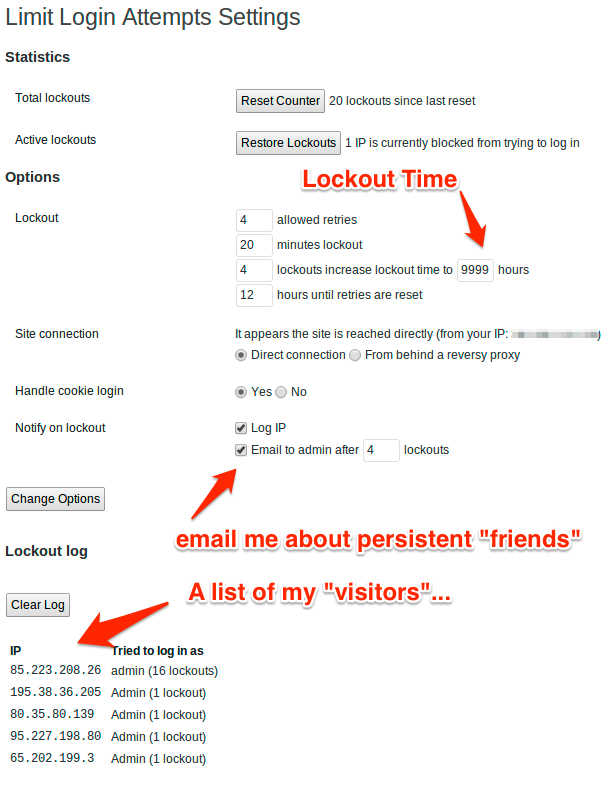 I have been using a free WordPress plugin to track unauthorized attempts to login to my WordPress instance. It is called “Limit Login Attempts” and can be found here: http://devel.kostdoktorn.se/limit-login-attempts. 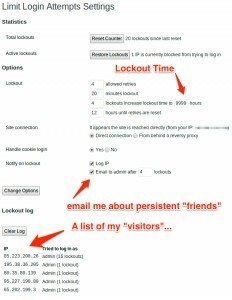 It comes configured to allow for 4 bad logins before blocking an IP address for 24 hours. I set mine up this way and watched over the next few days as the same IP tried every day and got blocked every day. At least this user is persistent, not smart, but persistent.. and noisy. Anyway, I have now moved the lockout time to 9999 hours (the max the box would allow for) just so I get less emails about this attacker. Another option is to limit your logins based on the originating IP address (this is a smart idea). If you are on the go as I am often connecting from your phone, home, and or work this is not your best option as the rules will get long and messy. It would also be “recommended” to disable or hobble your admin account. I set my admin account to a basic read only account and used a complex password generator so if you can get into that account, it’s yours read all you want, but no posting. Screenshot of the Plugin and it’s Logs, click on images for a larger view.